What possible influence could have a vibration on bearing condition? June 15, 2017, 9:15 p.m. When a bearing is not running, there is no lubricant film between the rolling elements and the raceways. The absence of lubricant film gives metal to metal contact and the vibrations produce small relative movements of rolling elements and rings. As a result of these movements, small particles break away from the surfaces and this leads to the formation of depressions in the raceways. This damage is known as false brinelling, sometimes also referred to as washboarding. Balls produce sphered cavities while rollers produce fluting. In many cases, it is possible to discern red rust at the bottom of the depressions. This is caused by oxidation of the detached particles, which have a large area in relation to their volume, as a result of their exposure to air. There is never any visible damage to the rolling elements. The greater the energy of vibration, the more severe the damage. The period of time and the magnitude of the bearing internal clearance also influence developments, but the frequency of the vibrations does not appear to have any significant effect. Roller bearings have proved to be more susceptible to this type of damage than ball bearings. This is considered to be because the balls can roll in every direction. Rollers, on the other hand, only roll in one direction; movement in the remaining directions takes the form of sliding. 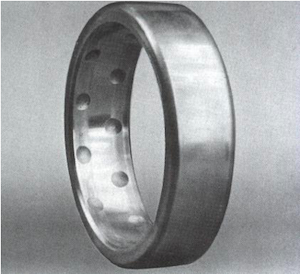 Cylindrical roller bearings are the most susceptible. The fluting resulting from vibrations sometimes closely resembles the fluting produced by the passage of electric current. However, in the latter case the bottom of the depression is dark in color, not bright or corroded. The damage caused by electric current is also distinguishable by the fact that the rolling elements are marked as well as the raceways. Bearings with vibration damage are usually found in machines that are not in operation and are situated close to machinery producing vibrations. Examples that can be cited are transformer fans, stand-by generators and ships' auxiliary machinery. 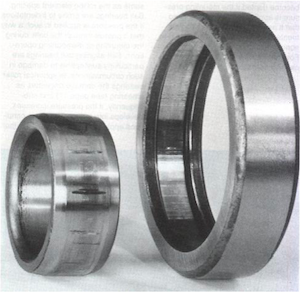 Bearings in machines transported by rail, road or sea may be subject to vibration damage too. Depressions in the raceways. These depressions are rectangular in roller bearings and circular in ball bearings. The bottom of these depressions may be bright or dull and oxidized. The bearing has been exposed to vibration while stationary. Action: The root cause of false brinelling is lack of knowledge that it is a problem as well as lack of a routine maintenance program. Root solutions thus involve becoming knowledgeable on the subject as well as establishing a routine maintenance program for your motors and driven equipment. During transportation of motors (or any type of rotating equipment which utilizes anti-friction bearings), make sure the shaft is "blocked" to prevent axial or radial movement. Blocking eliminates the clearance between the races and the rotating elements in the bearing and thus prevents these parts from "banging" against one another and causing wear. Choose storage locations as far away as possible from sources of external vibration. For example, locating a rotating equipment warehouse adjacent to a ball mill is not a good idea. In addition, turn the shaft of all stored rotating equipment at least once a month. Turning the shaft moves the rolling elements of the bearing to a new position with each turn, and also redistributes the settled lubrication grease/oil throughout the bearing. In any rotating equipment plant system that has a backup or spare system, there is no reason to designate one system as the "primary" and the other as the "backup". Each system should "share the load" equally. Thus, establish a schedule to run each system roughly half the time, switching at least once a week. June 15, 2017, 9:28 p.m.